Today, New York Times published an article with an interview to Harold “Sonny” White about NASA studies on warp drive (see here). This revamped the interest about what NASA is funding (with a really small budget being just $50,000) on this that have to be considered forefront research. For the readers that are not aware about what this research is aimed to, I invite them to read the very good article on Wikipedia about Alcubierre drive. As can be easily imagined, this article gets some new adding each day and moves the curiosity of a myriad of people around the world. So, the activity of this NASA’s group is under a lot of attention by media and, with a lot of skepticism, by the scientific community. Alcubierre itself, the inventor of this idea, does not believe at all that is doable. The main reasons are well explained here (hat tip to Jennifer Ouellette) and one of these, the most important one maybe, is a lot of missing information as studies on this idea showed more its impossibility than else. Anyhow, we hope that Harold White will fill all the details at 2013 Starship Congress that he will attend giving a talk (see here). The schedule is here. He will speak on August 17th. On 18th July the first summer HEP Conference will start in Stockholm. We do not expect great announcements from CMS and ATLAS as most of the main results from 2011-2012 data were just unraveled. The conclusions is that the particle announced on 4th July last year is a Higgs boson. It decays in all the modes foreseen by the Standard Model and important hints favor spin 0. No other resonance is seen at higher energies behaving this way. It is a single yet. There are a lot of reasons to be happy: We have likely seen the guilty for the breaking of the symmetry in the Standard Model and, absolutely for the first time, we have a fundamental particle behaving like a scalar. Both of these properties were looked upon for a long time and now this search is finally ended. 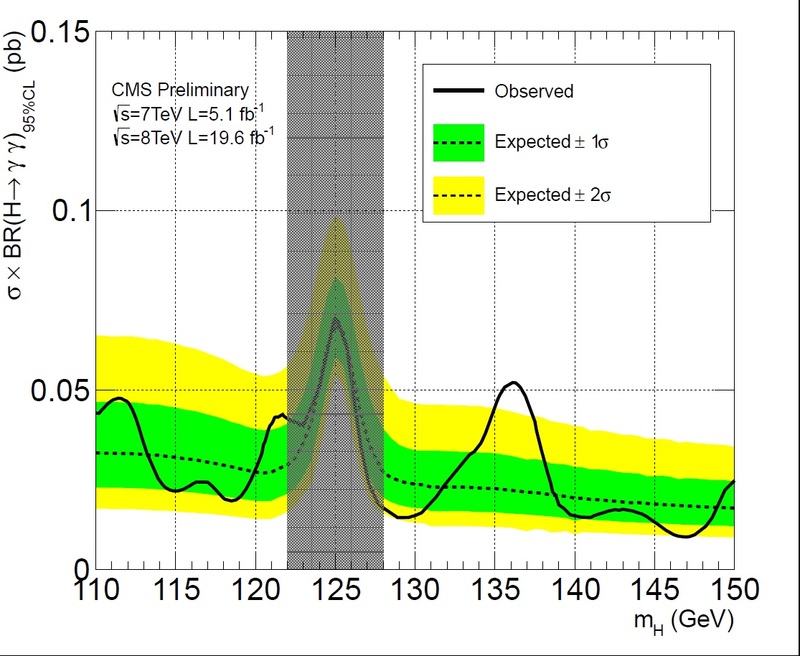 On the bad side, no hint of new physics is seen anywhere and probably we will have to wait the restart of LHC on 2015. The long sought SUSY is at large yet. Notwithstanding this hopeless situation for theoretical physics, my personal view is that there is something that gives important clues to great novelties that possibly will transmute into something of concrete at the restart. It is important to note that there seem to exist some differences between CMS and ATLAS and this small disagreement can hide interesting news for the future. I cannot say if, due to the different conception of this two detectors, something different should be seen but is there. Anyway, they should agree in the end of the story and possibly this will happen in the near future. The first essential point, that is often overlooked due to the overall figure, is the decay of the Higgs particle in a couple of W or Z. WW decay has a significantly large number of events and what CMS claims is indeed worth some deepening. This number is significantly below one. There is a strange situation here because CMS gives and in the overall picture just write and so, I cannot say what is the right one. But they are consistent each other so not a real problem here. Similarly, ZZ decay yields . ATLAS, on the other side, yields for WW decay and for ZZ decay . Error bars are large yet and fluctuations can change these values. The interesting point here, but this has the value of a clue as these data agree with Standard Model at , is that the lower values for the WW decay can be an indication that this Higgs particle could be a conformal one. This would mean room for new physics. For ZZ decay apparently ATLAS seems to have a lower number of events as this figure is somewhat larger and the error bar as well. Anyway, a steady decrease has been seen for the WW decay as a larger dataset was considered. This decrease, if confirmed at the restart, would mean a major finding after the discovery of the Higgs particle. It should be said that ATLAS already published updated results with the full dataset (see here). I would like to emphasize that a conformal Standard Model can imply SUSY. but ATLAS sees nothing there and this is possibly a fluke. Anyway, this is about and so CMS reported about on a publication of them. Finally, it is also possible that heavier Higgs particles could have depressed production rates and so are very rare. This also would be consistent with a conformal Standard Model. My personal view is that all hopes to see new physics at LHC are essentially untouched and maybe this delay to unveil it is just due to the unlucky start of the LHC on 2008. Meantime, we have to use the main virtue of a theoretical physicist: keeping calm and being patient. Update: Here is the press release from CERN. You are currently browsing the The Gauge Connection blog archives for July, 2013.